It's been exactly 50 days since I started the "getting out of idea debt" daily painting project and I have done......drum roll....19 paintings. That should be a depressing number but it isn't. I started off this project with the goal of clearing out the clutter of ideas I've been harboring for years. I felt like all the painting ideas that I've accumulated were all a disconnected mess with no connecting theme, style, or vision. What I've realized from just the 19 paintings and seeing them hanging on my wall in a beautiful grid is that they all have something in common and I'm liking how they are coming along. Seeing the paintings together, I could see the forest and not just each individual tree. I found that the beach painting of the Dania Beach pier looked great hung in an array next to the parking lot paintings. My sign paintings also looked pretty good next to the solar eclipse series. I could start to see what the commonality that attracted me to these visuals and to start to see a "brand" and potentially a market and marketing strategy. When I look at the groupings of my paintings, I see theme's of "memory/reflection/sentimental", "story", and "subtle". However, what I see may not be complete or even accurate. What do you see? ( I really want to know- even if it's a criticism). After 19 paintings, I see where I want to go and I think the next 31 paintings might actually be done in no more than 45 days. Honestly, a 10 x 10 inch painting a day was a lofty goal. Day job, commissions, and my kid all take time. I heard this phrase concerning time management and projects at a seminar: "We all have a four burner stove and maybe an oven". You can have two items cooking in the front, two items simmering in the back, and maybe something baking in the oven. If you have a family and a day job, they will take up two of your burners and will alternate between cooking and simmering. So, really I have only two burners- a cooking and a simmer (almost like every actual stove I've owned until recently). 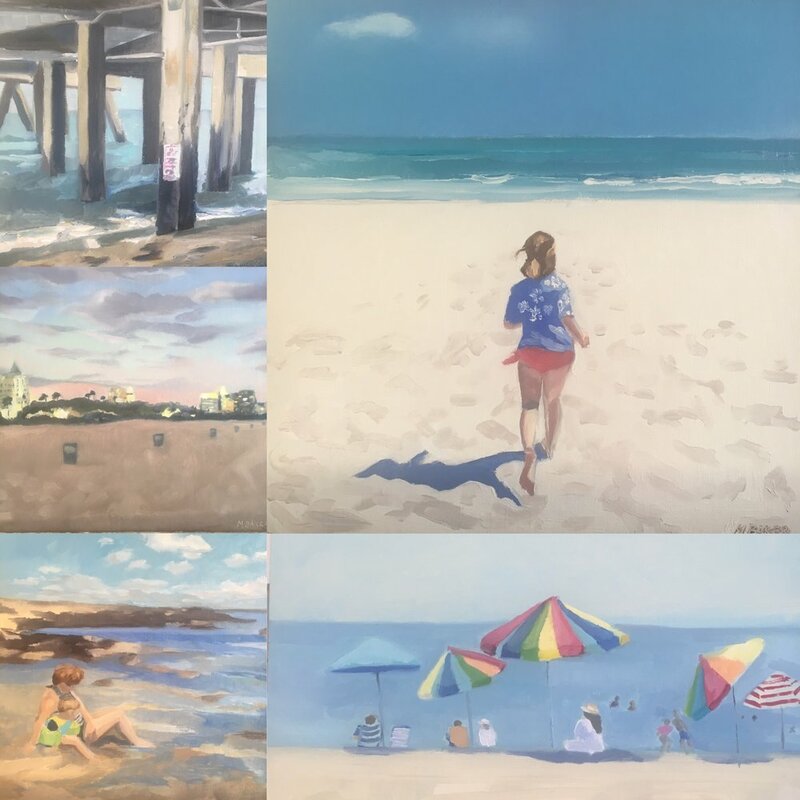 Thanks for following along, Oh and if you see one or two of these (I personally think 3 to 6 look awesome) that you like- 10% discount on multiple paintings. I finished the first series in my 60 days of daily paintings: I wish I was at the beach. Painting the beach is almost as relaxing as being at the beach. I also realized that it's my favorite subject. The paintings that I like the most and think turned out the best took the least amount of time to paint. I didn't let myself overwork or think too much. On average each painting took about an hour and half but some like the painting of my friend's daughter running towards the beach took half that time. Moving faster and being less precious with the painting had some good results. My next series of 5 will be Signage of Central Florida. 5 down, 55 to go. Idea debt: when you spend more time planning in your head an awesome project than actually creating it. The further into debt you become on an idea the more overwhelming it can be to start the project. I've been in idea debt for years. Hundreds and hundreds of quick photos, sketches, and scribbles -all of them painting ideas. Each idea honed while I was doing nothing in particular -like getting ready in the morning, driving to my day job, driving home from my day job, grocery shopping, waiting in line, and so on. There's a lot of backlogged ideas that at this point, I don't even know if they are good ideas any longer. They might just be crap. However, I feel like I can't move forward until I clear up the backlog. To get out of idea debt, I'm going to clear out the backlog. Over the next 60 days I will paint one 10x10 inch painting daily. There will be 12 themes with each theme consisting of 5 paintings. My goals for this exercise are to clear out all the old ideas, to hone my painting skills and to generate fresh ideas. The first week began yesterday, March 19th. The theme for this first series is: I wish I was at the beach. Themes for upcoming series (in no particular order): Views from 7th floor parking garage in Orlando, trees, animals, tourist trap, shop windows, children, signs, construction, nostalgia, cityscapes/buildings, and flowers. These paintings will be listed on my Daily Paintworks gallery (link on my page under Art for Sale) and will be posted daily on my Facebook page and Instagram. My son and I took a weekday trip to the beach for some playing in the sand and painting. My favorite spot to paint the beach is Cape Canaveral National Seashore. The National beach park is the only beach I know of in Central Florida that is still natural and uncrowded- no condos, no houses, no restaurants, no piers, and no jetties. There are the dunes, beach, and the ocean. And if there's been a big storm- a great place to find seashells. I set up my Open Box M paintbox and easel along with our beach chairs and towels. I dug the easel down to keep it from flying away in the wind. As I set up my paints, I placed the panel for the painting on my beach chair. Just then, a huge wave came up and washed into the chair and over the panel. Luckily, the panel didn't float away. It just got a nice priming of sea water to give it that authenticity of a seascape. It was a beautiful, sunny day with a cool breeze near the water and just a few people on the beach, mostly fishing. My painting buddy kept busy looking for shells and running down to the water to chase the waves out. It was a perfect day: painting, the beach, and my son. Hi, my name is Margaret and I want to be a professional artist. Specifically, a painter. WOW! That feels amazing to say. Just typing out what I actually want into actual words for others to see is very freeing. Why have I never done this before? Oh right...because it's scary and big and difficult and the path isn't clear and if I fail, how will I afford food and clothing and put a roof over my head? What a ridiculously unrealistic career! (just ask anyone). Like anyone that declares they want to be an artist, I have a passion for art and creating. There's where it begins...passion. I see something, think something, dream something and then create. Voila...artist! There is a problem with passion though because it sets you up for disappointment and soul crushing depression if it turns out your passion doesn't sell and no one likes it. Maybe you aren't good enough. Maybe you should keep this to yourself. Maybe you should just go off and eat worms. Or maybe you should become an accountant. I got good at being an accountant because I worked and worked and worked. A good chunk of my career was learning under pressure. Now, I'm at a certain point in my life that the learning curve isn't so steep and I can't help but think, is this what I want to do? Is this what I want to keep working for? I know, kind of sounding like a mid-life crisis. Well, it sort of is. "You are a long time dead. So enjoy life." This comes from the artist bio of Sharon Muldoon and it is the truth. I'm borrowing this as my new mantra. (in case you are wondering, my old mantra was "not my problem, not my problem."). I like creating art. It's my happy place and after 15 years in the business world, I can see what I really want is a business of my own. I know to be successful you work, you persevere, you learn, and eventually you get to where you want to go even if the path wasn't so easy and clear as first thought. Thinking of this as a business is still scary but freeing. I've seen many business start from an idea and grow. I've also seen those without a vision or plan fail. Why should being an artist be any different than starting any other business endeavor? Sure, I may still have a little bit of my heart on my sleeve when it comes to my dreams and passions but this is a business. I'm going to work and work and work. I can understand this. So, will I succeed? I think there is more than a 50% chance I might. Like anything you want, it comes with just beginning and then just continuing. On this blog I will post my work-in-process, stuff I learn, my triumphs and my setbacks. Enjoy!